In a significant development, the Central Bureau of Investigation has moved the trial court here to reopen the 1984 anti-Sikh riot cases against Congress MP Sajjan Kumar, seeking original documents of the cases, which were closed without even filing the charge sheets. Should the French ship Clemenceau be allowed to land on Indian shores? An impressive parade showcasing the competency of the world’s second largest military and bestowing of the Sena Medal to 19 Army personnel in recognition of their gallantry marked the Army Day celebrations today. GOC-in-C Northern Command Lt Gen Deepak Kapoor presented gallantry and distinguished services awards to 25 Army personnel at an investiture ceremony here today. Having broadened the dialogue process in Jammu and Kashmir by holding talks with a group outside the Hurriyat Conference, the Centre is now likely to invite other separatist leaders in the valley for talks. The Jammu and Kashmir police unearthed a militant plan to assassinate former Chief Minister Mufti Mohammad Sayeed when it arrested two militants of Pakistan-based Lashker-e-Toiba, including a Municipal Councillor of the Peoples Democratic Party a partner in the coalition government. Jammu and Kashmir police has registered a case against security forces for allegedly torturing to death one person and critically injuring another in North Kashmir today. In a state where the number of ration cards was higher than the voters, then how can one expect free and fair elections under this government? The official apathy has forced three freedom fighters to leave their native village of Chandmari for want of proper medical care as the village could not be linked to the main road by only a 1-km stretch. Africans walked away with the top honours at the third Standard Chartered Mumbai Marathon today. In the men’s Full Marathon, Kenya’s Daniel Rono clocked 2:12:03 to emerge the winner. Bollywood actors Abhishek Bachchan and Rani Mukherjee during the Mumbai Marathon-2006 in Mumbai on Sunday. The 300-km Jammu-Srinagar national highway was today closed to vehicles following fresh snowfall and landslides triggered by rains. 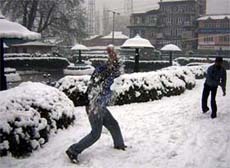 The Jammu-Srinagar flights were also cancelled due to bad weather.